If you want some extra “jerk” to your seasoning, just add a little more red pepper. I try to keep things on the mild end because of the little ones in the house. Over the past few years, I’ve taken a number of steps toward healthier eating on a budget. In addition to making my own salad dressings, I’ve also discovered that my homemade seasoning mixes are much tastier than the varieties I used to purchase at the store. My taco seasoning is used weekly in my home and I make homemade ranch dressing several times a month for my salads for lunch. Finally, I’ve now figured out my homemade jerk seasoning mix! It took a little tweaking, but I’ve gotten it right. Jerk seasoning is perfect for grilling, baking and frying chicken. It also does well on turkey and pork chops and it makes for a delicious burger when you mix the seasoning into the beef patties. Here is a “ratio recipe” for making your own jerk seasoning. And if you want to turn the heat down a little on this seasoning, just use one teaspoon of the crushed red pepper. But then you’d have to call it part-jerk seasoning! 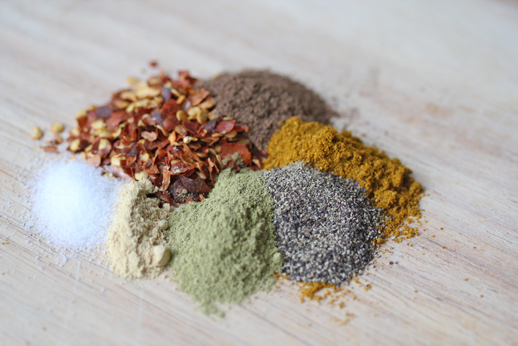 Combine all the ingredients and use it in place of store-brought jerk seasoning when needed in recipes. Save in an airtight container (such as a Ziploc® Brand Container) and store in a dry place or freezer. Pull the skin back on each drumstick and brush with one teaspoon of olive oil. Sprinkle the jerk seasoning all over the chicken and underneath the skin. Pull the skin back over the seasonings. Grill for eight to 10 minutes on each side or until cooked through. Serve the grilled jerk chicken with your favorite side, salad or fresh fruit. What’s your favorite jerk recipe? Do you prefer full-jerk (spicy), half-jerk (a little spicy), or no jerk at all? Recipe originally posted on SCJohnson.com. Note: I am a paid freelance writer for the SCJohnson.com Family Economics blog. Thanks for sharing this recipe. I hope to do it the next day I visit my kitchen.